Time FLIES. Honestly, how has it been over three months since I brought my little lover into the world? So therefore I thought it might be nice to update you on how Felix is going, and what he has achieved so far! Now Felix is in fact close to three and a half months, so I am already late in writing this post, however I am sure those of you who have had newborns before would completely understand! I definitely didn’t realise how much time a new little baby could absorb from an adult, I honestly thought I could still be regularly consistent with my videos and blog posts without overly too much time in between. Boy was I wrong about that! Things now have definitely calmed down, but at the very beginning I quickly learnt I had no chance and was napping any spare moment I could! Lets start with his sleeping. For the first couple of months Felix was sleeping only about three hours at a time, sometimes less over night. Through the day was the same deal, but usually less. So you can only imagine how exhausted I was, especially for a first time mumma who had never experienced this before. Nick took three weeks off maternity leave (a week extra than planned because I had to stay in the hospital for a week, recovering from my C section) so he was a big help for a bit. Then once he went back to work my mum would come and help me out, as being a school teacher, she had a lot of holidays under her sleeve, being just after the festive season. Now, Felix is sleeping for much longer at night, is easier to get to bed, and even lets me sleep in sometimes. He doesn’t nap as much throughout the day anymore, but I can handle it if I get a good night sleep. I no longer need to nap anymore. Also as soon as it hit three months, Master Felix moved out of his bassinet into his ‘big boy bed’ (aka, his lovely cot Nan and Pop had bought). This move was really hard for me as I used to always have Felix right next to me on my side of the bed in his bassinet, then all of a sudden he was at the other side of the room! It was definitely a move that needed to be done though, because he was just getting far too big for the bassinet, it was beginning to look ridiculous. Plus, he also started to make it move slightly from all his dance parties he would have in the middle of the night which was quite concerning, so once that began I was like, ‘right, big boy bed it is then!’ He now sleeps quite well in his cot, and we also now use our monitor which is super handy and reassuring for this anxious mumma! He is now showing a lot more interest in the world, he’s so alert and I’ve recently noticed he has begun to open his eyes really wide when he appears interested in something. He also really likes the television (facepalm) so we make sure he doesn’t watch it all day! We do this by reading him stories, taking him for walks, giving him lots of cuddles, love and attention, talking to him, putting him in his swing and also simply by positioning him differently on his play mat so it’s harder for him to see the screen. I don’t believe there is anything wrong with him watching the TV, after all it is the brightest thing in the room. However, I definitely don’t let him do it for hours! We have been practising tummy time at least once a day, and Felix has once managed to roll from his tummy to his back! It was a very proud moment indeed! Felix does tend to get a bit upset with it after a few moments of trying however, so we don’t force it on him for too long. Eventually he will be able to roll every time, and then we can work on tummy to back! After all, not all children hit all their milestones at the same rate! I am just super impressed he was able to do it the first time, go Feelie! He is also getting really good and holding up his head, soon we will have a little man who will need a highchair because he’s big enough to try solid foods, OH MY! Felix loves bath time! And in fact, so does Mummy! I absolutely LOVE cleaning his chubby little body, and tipping warm water over his belly while he lies in the tub, smiling at both Daddy and I, usually with one foot in, one foot out. I swear he could just lie in there all day if he was allowed too! I can’t wait till he’s bigger so we can put him in the big bath and introduce bath toys and bubble bath! Felix also loves visitors! He is such a sweet little boy when people come over for a cuddle, and he likes to show off his cooing skills, which instantly melts their hearts! He will happily let anybody hold him and have a little chat – but he definitely will let you know when he has had enough! 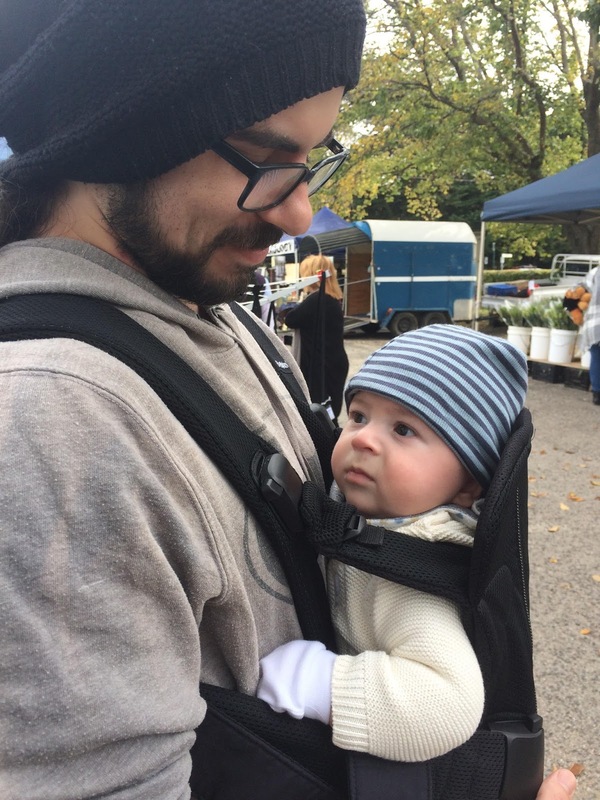 Felix had his first trip to the Market over the weekend which involved the first use of his baby bjorn carrier! And he was SUCH a good boy in it! He loved looking around at all the people, listening to the different noises, and was quite interested every time the man with the pony rides walked past! One day, he will be big enough to be one of those children he saw, and I can’t wait to see the expression on his face! It made my heart so big just watching him take everything in for the first time! He is also so fascinated with trees and shadows! 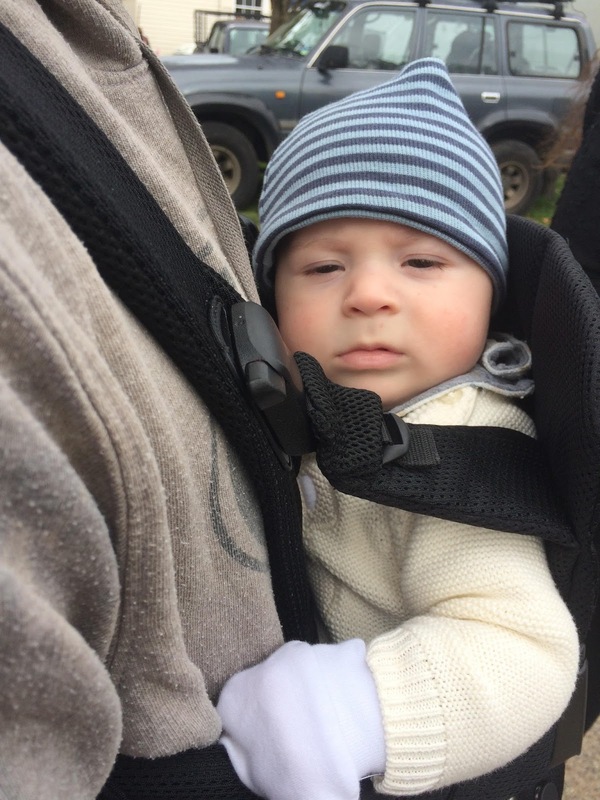 Speaking of going out and about, we recently changed his pram so it is not in bassinet mode anymore, and now when he is getting pushed around he’s raised up and can see more of his surroundings, and we don’t have that bulky part over his feet any longer. So that’s all I can think of for now, I’m sure there is more, but I need to wrap up this post now anyway because a certain somebody is showing signs of being hungry again. Ahh, the new mum life! Anyway, I’ll be sure to keep updating you all on Felix’s milestones and development, along with beautiful photos of my gorgeous, healthy, growing bubba.